Interview courtesy of the Ephemera Blog, Marty Weil’s great information resource on ephemera collecting and collectors, and a member of our Hall of Fame. Malcolm Warrington’s site The Scrap Album is also a member of our Hall of Fame. Malcolm Warrington is based 12 miles to the west of Central London. 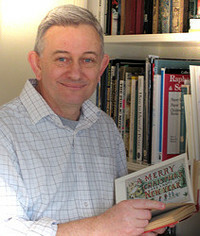 He is a council member of the UK Ephemera Society with responsibility for the society’s web site. He also has his own site, The Scrap Album, which examines the history of Victorian Greeting Cards to illustrate how a small private collection can be used to inspire, inform, educate, and give pleasure to people of all kinds. Q: It’s an honor to speak to you about your Victorian greeting cards, Malcolm. Tell me about how the collection has evolved. A: I started collecting some 35 years ago, in the area of children’s postcards by such artists as Mabel Lucie Attwell, Agnes Richardson, Susan Beatrice Pearce, HGC Harsh-Lambert and many others usually from the period 1920s-1930s. As every collector experiences, your focus begins to wander and I was no exception. Discovering other categories of post cards that were visually attractive was exciting, and it wasn’t long before I became aware of Victorian greeting cards while searching through the stock of post card dealers. These colorful greetings, printed by chromolithography, seemed so much more appealing, were finely printed and the subject matter vast and varied. 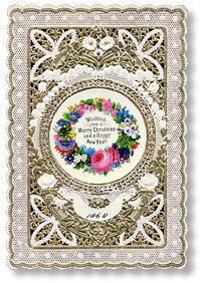 Collecting of Victorian greetings card began in earnest and I still actively collect them today, as well as many other types of printed ephemera. Q. (Weil/ephemera): All collectors, even experienced ones such as yourself, face obstacles in collecting. Can you tell me about how you deal with these challenges? A. (Warrington): As my collection grew I became interested in learning more about the manufacturers of these cards and acquiring some of their advertising and marketing ephemera as well as researching where their factories and offices were situated and trying to obtain photographs or illustrations of them. This is now one of my greatest challenges. While some success has come with the major publishers such as Raphael Tuck, Hildeshiemer & Faulkner, Marcus Ward and Louis Prang, it’s very difficult to unearth material from many of the other companies from that era. The Internet makes it easier to target any such items but can make it more difficult to purchase as you will inevitably be involved in a bidding war. Q. (Weil/ephemera): What are your favorite items in the collection? A. (Warrington): My first selection, dated 1868, illustrates the lace paper type of greeting. Undoubtedly a development from the valentine, of the same period, to which they are almost identical with only the Christmas and New Year greeting to distinguish them. The next two curious cards, by De La Rue & Co, reflect the Victorians fascination with humor of all kinds. The card with the rats feasting on their Christmas dinner of cat won the UK Ephemera Society’s most tasteless Christmas Card competition in 2003. The traditional English Christmas dinner of turkey get their revenge, on this card, by turning the tables and spit roasting a human! The final card, an example of superior printing by De La Rue & Co, is a Birthday greeting and exemplifies the Victorian respect for family and the tradition which brings together several generations for Christmas and birthday celebrations. Q. (Weil/ephemera): It’s a delight to see your enthusiasm for these objects. Tell me what advice do you have for collectors. And what resources should they seek out? A. (Warrington): It’s impossible to collect every single card that was published so don’t buy everything you see, aim for a representative collection that reflects early and later types; try to obtain examples of most publishers and artists that appear on the cards. While you’re doing this you’ll discover many other areas of interest that will enhance your collection. The definitive book on Victorian greeting cards is The History of the Christmas Card by George Buday, originally published in 1954, copies often appear on eBay, this book is a must for greeting card collectors. Another resource is A Gallery of Greetings by the late Laura Seddon, published 1992. A catalogue of her collection of 32,000 Victorian & Edwardian greeting cards she donated to the Manchester Metropolitan Museum, Manchester, England. For archival safety the collection is stored in Secol Polyester based sleeves which are stored in ring binder boxes. Weil/ephemera: It’s been a pleasure speaking with you, Malcolm. I appreciate the time you’ve taken to share your collection and expertise. Hello,I am unable to make contact through your website “The scrap album” would you give me your Email please.Thanks, Joe. Hello! I have come across three “greeting card” prints from around 1880-85. They are all double-sided with colored fringe borders. One was given to my great-great grandparents on the day of their wedding, 12/18/1884. It is 2″x3″, a floral print with sentiment “Love and Peace May flowers of love around the be twined; and the sunshine of peace shed its joy over they mind”. The other two are larger, 5″ x 7″, again the two-sided card, with fringe. One of these is a floral print with a Valentine’s sentiment and the other is a bird print, Spring sentiment on one side and Winter sentiment on the other. I’m so curious about them and desire the information before I pack them up for “the next generation”! I could scan them to your email?? I’m conservator and I’m worked on a otto dix painting. He applied glitter on the painting to give it a sparkling effect. I am now interested to study the diffusion of this material in art and crafts. I found a wide use of glitter in the victorian greeting cards. But no more. Have you more information about it? (the first use, the technical of production ecc.). can you advise me a bibliografy ? I have some 40s era family greeting cards which have, for want of a better description, a “satin” finish. The paper has texture felt with a thumbnail and with light playing over it it has a pattern of reflection like lace or satin. It has the usual titles, messaged and images for a Valentine from that period. Just curious if this is a special lithographic style or how this texture and reflectivity were achieved. “ ” He’d be surfing at Ocean Beach basically in rubber overalls filled with water.